For other uses, see Meat (disambiguation). Meat is animal flesh that is eaten as food. Humans have hunted and killed animals for meat since prehistoric times. The advent of civilization allowed the domestication of animals such as chickens, sheep, rabbits, pigs and cattle. This eventually led to their use in meat production on an industrial scale with the aid of slaughterhouses. Meat is important in economy and culture, even though its mass production and consumption has been determined to pose risks for human health and the environment. Many religions have rules about which meat may or may not be eaten. Vegetarians may abstain from eating meat because of concerns about the ethics of eating meat, environmental effects of meat production or nutritional effects of consumption. The word meat comes from the Old English word mete, which referred to food in general. The term is related to mad in Danish, mat in Swedish and Norwegian, and matur in Icelandic and Faroese, which also mean 'food'. The word mete also exists in Old Frisian (and to a lesser extent, modern West Frisian) to denote important food, differentiating it from swiets (sweets) and dierfied (animal feed). Most often, meat refers to skeletal muscle and associated fat and other tissues, but it may also describe other edible tissues such as offal. :1 Meat is sometimes also used in a more restrictive sense to mean the flesh of mammalian species (pigs, cattle, lambs, etc.) raised and prepared for human consumption, to the exclusion of fish, other seafood, insects, poultry, or other animals. In the context of food, meat can also refer to "the edible part of something as distinguished from its covering (such as a husk or shell)", for example, coconut meat. Sheep, originating from western Asia, were domesticated with the help of dogs prior to the establishment of settled agriculture, likely as early as the 8th millennium BCE. :3 Several breeds of sheep were established in ancient Mesopotamia and Egypt by 3500–3000 BCE. :3 Today, more than 200 sheep-breeds exist. A Hereford bull, a breed of cattle frequently used in beef production. Other animals are or have been raised or hunted for their flesh. The type of meat consumed varies much between different cultures, changes over time, depending on factors such as tradition and the availability of the animals. The amount and kind of meat consumed also varies by income, both between countries and within a given country. Horses are commonly eaten in France, Italy, Germany and Japan, among other countries. Horses and other large mammals such as reindeer were hunted during the late Paleolithic in western Europe. Dogs are consumed in China, South Korea and Vietnam. Dogs are also occasionally eaten in the Arctic regions. Historically, dog meat has been consumed in various parts of the world, such as Hawaii, Japan, Switzerland and Mexico. Cats are consumed in Southern China, Peru and sometimes also in Northern Italy. Guinea pigs are raised for their flesh in the Andes. Whales and dolphins are hunted, partly for their flesh, in Japan, Alaska, Siberia, Canada, the Faroe Islands, Greenland, Iceland, Saint Vincent and the Grenadines and by two small communities in Indonesia. Even though it is a very old industry, meat production continues to be shaped strongly by the evolving demands of customers. The trend towards selling meat in pre-packaged cuts has increased the demand for larger breeds of cattle, which are better suited to producing such cuts. :11 Even more animals not previously exploited for their meat are now being farmed, especially the more agile and mobile species, whose muscles tend to be developed better than those of cattle, sheep or pigs. :11 Examples are the various antelope species, the zebra, water buffalo and camel,:11ff as well as non-mammals, such as the crocodile, emu and ostrich. :13 Another important trend in contemporary meat production is organic farming which, while providing no organoleptic benefit to meat so produced, meets an increasing demand for organic meat. ... meat consumption in emerging economies is on the rise. According to the analysis of the FAO the overall consumption for white meat between 1990 and 2009 has dramatically increased. For example, poultry meat has increased by 76.6% per kilo per capita and pig meat by 19.7%. However, on the contrary, bovine meat has decreased from 10.4 kilograms (23 lb)/capita in 1990 to 9.6 kilograms (21 lb)/capita in 2009. Agricultural science has identified several factors bearing on the growth and development of meat in animals. Experimental reproductive cloning of commercially important meat animals such as sheep, pig or cattle has been successful. Multiple asexual reproduction of animals bearing desirable traits is anticipated,:22 although this is not yet practical on a commercial scale. Generally, the meat of adult mammals such as cows, sheep, and horses is considered red, while chicken and turkey breast meat is considered white. All muscle tissue is very high in protein, containing all of the essential amino acids, and in most cases is a good source of zinc, vitamin B12, selenium, phosphorus, niacin, vitamin B6, choline, riboflavin and iron. Several forms of meat are also high in vitamin K. Muscle tissue is very low in carbohydrates and does not contain dietary fiber. While taste quality may vary between meats, the proteins, vitamins, and minerals available from meats are generally consistent. The fat content of meat can vary widely depending on the species and breed of animal, the way in which the animal was raised, including what it was fed, the anatomical part of the body, and the methods of butchering and cooking. Wild animals such as deer are typically leaner than farm animals, leading those concerned about fat content to choose game such as venison. Decades of breeding meat animals for fatness is being reversed by consumer demand for meat with less fat. The fatty deposits that exist with the muscle fibers in meats soften meat when it is cooked and improve the flavor through chemical changes initiated through heat that allow the protein and fat molecules to interact. The fat, when cooked with meat, also makes the meat seem juicier. However, the nutritional contribution of the fat is mainly calories as opposed to protein. As fat content rises, the meat's contribution to nutrition declines. In addition, there is cholesterol associated with fat surrounding the meat. The cholesterol is a lipid associated with the kind of saturated fat found in meat. The increase in meat consumption after 1960 is associated with, though not definitively the cause of, significant imbalances of fat and cholesterol in the human diet. The table in this section compares the nutritional content of several types of meat. While each kind of meat has about the same content of protein and carbohydrates, there is a very wide range of fat content. Meat is produced by killing an animal and cutting flesh out of it. These procedures are called slaughter and butchery, respectively. There is ongoing research into producing meat in vitro, that is, outside of animals. Upon reaching a predetermined age or weight, livestock are usually transported en masse to the slaughterhouse. Depending on its length and circumstances, this may exert stress and injuries on the animals, and some may die en route. :129 Unnecessary stress in transport may adversely affect the quality of the meat. :129 In particular, the muscles of stressed animals are low in water and glycogen, and their pH fails to attain acidic values, all of which results in poor meat quality. :130 Consequently, and also due to campaigning by animal welfare groups, laws and industry practices in several countries tend to become more restrictive with respect to the duration and other circumstances of livestock transports. Animals are usually slaughtered by being first stunned and then exsanguinated (bled out). Death results from the one or the other procedure, depending on the methods employed. Stunning can be effected through asphyxiating the animals with carbon dioxide, shooting them with a gun or a captive bolt pistol, or shocking them with electric current. :134ff In most forms of ritual slaughter, stunning is not allowed. In the meat products sector of the Rungis International Market, France. During the first day after death, glycolysis continues until the accumulation of lactic acid causes the pH to reach about 5.5. The remaining glycogen, about 18 g per kg, is believed to increase the water-holding capacity and tenderness of the flesh when cooked. :87 Rigor mortis sets in a few hours after death as ATP is used up, causing actin and myosin to combine into rigid actomyosin and lowering the meat's water-holding capacity,:90 causing it to lose water ("weep"). :146 In muscles that enter rigor in a contracted position, actin and myosin filaments overlap and cross-bond, resulting in meat that is tough on cooking:144 – hence again the need to prevent pre-slaughter stress in the animal. The word "sausage" is derived from Old French saussiche, from the Latin word salsus meaning "salted". Salt is the most frequently used additive in meat processing. It imparts flavor but also inhibits microbial growth, extends the product's shelf life and helps emulsifying finely processed products, such as sausages. Ready-to-eat meat products normally contain about 1.5 to 2.5 percent salt. Salt water or similar substances may also be injected into poultry meat to improve the taste and increase the weight, in a process called plumping. Nitrite is used in curing meat to stabilize the meat's color and flavor, and inhibits the growth of spore-forming microorganisms such as C. botulinum. The use of nitrite's precursor nitrate is now limited to a few products such as dry sausage, prosciutto or parma ham. Phosphates used in meat processing are normally alkaline polyphosphates such as sodium tripolyphosphate. They are used to increase the water-binding and emulsifying ability of meat proteins, but also limit lipid oxidation and flavor loss, and reduce microbial growth. Erythorbate or its equivalent ascorbic acid (vitamin C) is used to stabilize the color of cured meat. Sweeteners such as sugar or corn syrup impart a sweet flavor, bind water and assist surface browning during cooking in the Maillard reaction. Seasonings impart or modify flavor. They include spices or oleoresins extracted from them, herbs, vegetables and essential oils. Flavorings such as monosodium glutamate impart or strengthen a particular flavor. Tenderizers break down collagens to make the meat more palatable for consumption. They include proteolytic enzymes, acids, salt and phosphate. Dedicated antimicrobials include lactic, citric and acetic acid, sodium diacetate, acidified sodium chloride or calcium sulfate, cetylpyridinium chloride, activated lactoferrin, sodium or potassium lactate, or bacteriocins such as nisin. Antioxidants include a wide range of chemicals that limit lipid oxidation, which creates an undesirable "off flavor", in precooked meat products. Acidifiers, most often lactic or citric acid, can impart a tangy or tart flavor note, extend shelf-life, tenderize fresh meat or help with protein denaturation and moisture release in dried meat. They substitute for the process of natural fermentation that acidifies some meat products such as hard salami or prosciutto. With the rise of complex supply chains, including cold chains, in developed economies, the distance between the farmer or fisherman and customer has grown, increasing the possibility for intentional and unintentional misidentification of meat at various points in the supply chain. In 2013, reports emerged across Europe that products labelled as containing beef actually contained horse meat. In February 2013 a study was published showing that about one-third of raw fish are misidentified across the United States. Various forms of imitation meat have been created for people who wish not to eat meat but still want to taste its flavor and texture. Meat imitates are typically some form of processed soybean (tofu, tempeh), but they can also be based on wheat gluten, pea protein isolate, or even fungi (quorn). Various environmental effects are associated with meat production. Among these are greenhouse gas emissions, fossil energy use, water use, water quality changes, and effects on grazed ecosystems. The livestock sector may be the largest source of water pollution (due to animal wastes, fertilizers, pesticides), and it contributes to emergence of antibiotic resistance. It accounts for over 8% of global human water use. It is by far the biggest cause of land use, as it accounts for nearly 40% of the global land surface. It is a significant driver of biodiversity loss, as it causes deforestation, ocean dead zones, land degradation, pollution, and overfishing. The occurrence, nature and significance of environmental effects varies among livestock production systems. Grazing of livestock can be beneficial for some wildlife species, but not for others. Targeted grazing of livestock is used as a food-producing alternative to herbicide use in some vegetation management. Meat production is responsible for 14.5% and possibly up to 51% of the world's anthropogenic greenhouse gas emissions. However, greenhouse gas emission depends on the economy and country: animal products (meat, fish, and dairy) account for 22%, 65%, and 70% of emissions in the diets of lower-middle–, upper-middle–, and high-income nations, respectively. Some nations show very different impacts to counterparts within the same group, with Brazil and Australia having emissions over 200% higher than the average of their respective income groups and driven by meat consumption. According to a report produced by United Nations Environment Programme's (UNEP) international panel for sustainable resource management, a worldwide transition in the direction of a meat and dairy free diet is indispensable if adverse global climate change were to be prevented. A 2019 report in The Lancet recommended that global meat (and sugar) consumption be reduced by 50 percent to mitigate climate change. Meat consumption in Western societies needs to be reduced by up to 90% according to a 2018 study published in Nature. Meat consumption is considered one of the primary contributors of the sixth mass extinction. A 2017 study by the World Wildlife Fund found that 60% of global biodiversity loss is attributable to meat-based diets, in particular from the vast scale of feed crop cultivation needed to rear tens of billions of farm animals for human consumption puts an enormous strain on natural resources resulting in a wide-scale loss of lands and species. Currently, livestock make up 60% of the biomass of all mammals on earth, followed by humans (36%) and wild mammals (4%). In November 2017, 15,364 world scientists signed a Warning to Humanity calling for, among other things, drastically diminishing our per capita consumption of meat and "dietary shifts towards mostly plant-based foods". A July 2018 study in Science says that meat consumption is set to rise as the human population increases along with affluence, which will increase greenhouse gas emissions and further reduce biodiversity. Meat-producing livestock can provide environmental benefits through waste reduction, e.g. conversion of human-inedible residues of food crops. Manure from meat-producing livestock is used as fertilizer; it may be composted before application to food crops. Substitution of animal manures for synthetic fertilizers in crop production can be environmentally significant, as between 43 and 88 MJ of fossil fuel energy are used per kg of nitrogen in manufacture of synthetic nitrogenous fertilizers. The spoilage of meat occurs, if untreated, in a matter of hours or days and results in the meat becoming unappetizing, poisonous or infectious. Spoilage is caused by the practically unavoidable infection and subsequent decomposition of meat by bacteria and fungi, which are borne by the animal itself, by the people handling the meat, and by their implements. Meat can be kept edible for a much longer time – though not indefinitely – if proper hygiene is observed during production and processing, and if appropriate food safety, food preservation and food storage procedures are applied. Without the application of preservatives and stabilizers, the fats in meat may also begin to rapidly decompose after cooking or processing, leading to an objectionable taste known as warmed over flavor. Fresh meat can be cooked for immediate consumption, or be processed, that is, treated for longer-term preservation and later consumption, possibly after further preparation. Fresh meat cuts or processed cuts may produce iridescence, commonly thought to be due to spoilage but actually caused by structural coloration and diffraction of the light. A common additive to processed meats, both for preservation and because it prevents discoloring, is sodium nitrite, which, however, is also a source of health concerns, because it may form carcinogenic nitrosamines when heated. Meat is prepared in many ways, as steaks, in stews, fondue, or as dried meat like beef jerky. It may be ground then formed into patties (as hamburgers or croquettes), loaves, or sausages, or used in loose form (as in "sloppy joe" or Bolognese sauce). Some meat is cured by smoking, which is the process of flavoring, cooking, or preserving food by exposing it to the smoke from burning or smoldering plant materials, most often wood. In Europe, alder is the traditional smoking wood, but oak is more often used now, and beech to a lesser extent. In North America, hickory, mesquite, oak, pecan, alder, maple, and fruit-tree woods are commonly used for smoking. Meat can also be cured by pickling, preserving in salt or brine (see salted meat and other curing methods). Other kinds of meat are marinated and barbecued, or simply boiled, roasted, or fried. Meat is generally eaten cooked, but many recipes call for raw beef, veal or fish (tartare). Steak tartare is a meat dish made from finely chopped or minced raw beef or horse meat. Meat is often spiced or seasoned, particularly with meat products such as sausages. 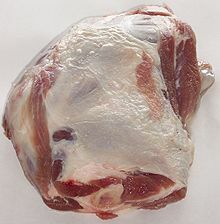 Meat dishes are usually described by their source (animal and part of body) and method of preparation (e.g., a beef rib). Meat is a typical base for making sandwiches. Popular varieties of sandwich meat include ham, pork, salami and other sausages, and beef, such as steak, roast beef, corned beef, pepperoni, and pastrami. Meat can also be molded or pressed (common for products that include offal, such as haggis and scrapple) and canned. There is concern and debate regarding the potential association of meat, in particular red and processed meat, with a variety of health risks. A study of 400,000 subjects conducted by the European Prospective Investigation into Cancer and Nutrition and published in 2013 showed "a moderate positive association between processed meat consumption and mortality, in particular due to cardiovascular diseases, but also to cancer." A 1999 metastudy combined data from five studies from western countries. The metastudy reported mortality ratios, where lower numbers indicated fewer deaths, for fish eaters to be 0.82, vegetarians to be 0.84, occasional meat eaters to be 0.84. Regular meat eaters and vegans shared the highest mortality ratio of 1.00. In response to changing prices as well as health concerns about saturated fat and cholesterol, consumers have altered their consumption of various meats. A USDA report points out that consumption of beef in the United States between 1970–1974 and 1990–1994 dropped by 21%, while consumption of chicken increased by 90%. During the same period of time, the price of chicken dropped by 14% relative to the price of beef. From 1995–1996, beef consumption increased due to higher supplies and lower prices. The 2015–2020 Dietary Guidelines for Americans asked men and teenage boys to increase their consumption of vegetables or other underconsumed foods because they eat too much protein. Various toxic compounds can contaminate meat, including heavy metals, mycotoxins, pesticide residues, and polyaromatic hydrocarbons. Often, these compounds can be metabolized in the body to form harmful by-products. Negative effects depend on the individual genome, diet, and history of the consumer. Meat and meat products may contain substances such as dioxins, polychlorinated biphenyl (PCBs), and cooked meat may contain carcinogens, that are toxic to the consumer, although any chemical's toxicity is dependent on the dose and timing of exposure. Toxins may be introduced to meat as part of animal feed, as veterinary drug residues, or during processing and cooking. There are concerns about a relationship between the consumption of meat, in particular processed and red meat, and increased cancer risk. The International Agency for Research on Cancer (IARC), a specialized agency of the World Health Organization (WHO), classified processed meat (e.g., bacon, ham, hot dogs, sausages) as, "carcinogenic to humans (Group 1), based on sufficient evidence in humans that the consumption of processed meat causes colorectal cancer." IARC also classified red meat as "probably carcinogenic to humans (Group 2A), based on limited evidence that the consumption of red meat causes cancer in humans and strong mechanistic evidence supporting a carcinogenic effect." The correlation of consumption to increased risk of heart disease is controversial. Some studies fail to find a link between red meat consumption and heart disease (although the same study found statistically significant correlation between the consumption of processed meat and coronary heart disease). A large cohort study of Seventh-Day Adventists in California found that the risk of heart disease is three times greater for 45-64-year-old men who eat meat daily, versus those who did not eat meat. This study compared adventists to the general population and not other Seventh Day Adventists who ate meat and did not specifically distinguish red and processed meat in its assessment. Prospective analysis suggests that meat consumption is positively associated with weight gain in men and women. The National Cattlemen's Beef Association countered by stating that meat consumption may not be associated with fat gain. In response, the authors of the original study controlled for just abdominal fat across a sample of 91,214 people and found that even when controlling for calories and lifestyle factors, meat consumption is linked with obesity. Additional studies and reviews have confirmed the finding that greater meat consumption is positively linked with greater weight gain even when controlling for calories, and lifestyle factors. Bacterial contamination has been seen with meat products. A 2011 study by the Translational Genomics Research Institute showed that nearly half (47%) of the meat and poultry in U.S. grocery stores were contaminated with S. aureus, with more than half (52%) of those bacteria resistant to antibiotics. A 2018 investigation by the Bureau of Investigative Journalism and The Guardian found that around 15 percent of the US population suffers from foodborne illnesses every year. The investigation also highlighted unsanitary conditions in US-based meat plants, which included meat products covered in excrement and abscesses "filled with pus". Meat can transmit certain diseases, but complete cooking and avoiding recontamination reduces this possibility. Meat is part of the human diet in most cultures, where it often has symbolic meaning and important social functions. Many people, however, choose not to eat meat (this is referred to as vegetarianism) or any food made from animals (veganism). The reasons for not eating all or some meat may include ethical objections to killing animals for food, health concerns, environmental concerns or religious dietary laws. Ethical issues regarding the consumption of meat include objecting to the act of killing animals or to the agricultural practices used in meat production. Reasons for objecting to killing animals for consumption may include animal rights, environmental ethics, or an aversion to inflicting pain or harm on other sentient creatures. Some people, while not vegetarians, refuse to eat the flesh of certain animals (such as cows, pigs, cats, dogs, horses, or rabbits) due to cultural or religious traditions. Some people eat only the flesh of animals that they believe have not been mistreated, and abstain from the flesh of animals raised in factory farms or else abstain from particular products, such as foie gras and veal. Some techniques of intensive agriculture may be cruel to animals: foie gras is a food product made from the liver of ducks or geese that have been force fed corn to fatten the organ; veal is criticised because the veal calves may be highly restricted in movement, have unsuitable flooring, spend their entire lives indoors, experience prolonged deprivation (sensory, social, and exploratory), and be more susceptible to high amounts of stress and disease. The religion of Jainism has always opposed eating meat, and there are also schools of Buddhism and Hinduism that condemn the eating of meat. Jewish dietary rules (Kashrut) allow certain (kosher) meat and forbid other (treif). The rules include prohibitions on the consumption of unclean animals (such as pork, shellfish including mollusca and crustacea, and most insects), and mixtures of meat and milk. Similar rules apply in Islamic dietary laws: The Quran explicitly forbids meat from animals that die naturally, blood, the meat of swine (porcine animals, pigs), and animals dedicated to other than Allah (either undedicated or dedicated to idols) which are haram as opposed to halal. Sikhism forbids meat of slowly slaughtered animals ("kutha") and prescribes killing animals with a single strike ("jhatka"), but some Sikh groups oppose eating any meat. Research in applied psychology has investigated practices of meat eating in relation to morality, emotions, cognition, and personality characteristics. Psychological research suggests meat eating is correlated with masculinity, support for social hierarchy, and reduced openness to experience. Research into the consumer psychology of meat is relevant both to meat industry marketing and to advocates of reduced meat consumption. ^ a b c d e f g h i j k l m n o p q r s t u v w x y z aa ab ac ad ae af ag ah ai aj ak al am an ao ap aq ar as at au av aw ax ay az ba bb bc bd be bf bg bh bi bj bk bl bm bn bo bp bq br bs bt bu bv bw bx by bz ca cb cc cd Lawrie, R.A.; Ledward, D A. (2006). Lawrie's meat science (7th ed.). Cambridge: Woodhead Publishing Limited. ISBN 978-1-84569-159-2. ^ "Meat definition and meaning | Collins English Dictionary". www.collinsdictionary.com. Retrieved June 16, 2017. ^ a b "Definition of MEAT". www.merriam-webster.com. Retrieved June 16, 2017. ^ Mark Gehlhar and William Coyle, "Global Food Consumption and Impacts on Trade Patterns" Archived September 5, 2012, at the Wayback Machine, Chapter 1 in Changing Structure of Global Food Consumption and Trade Archived February 26, 2013, at the Wayback Machine, edited by Anita Regmi, May 2001. USDA Economic Research Service. ^ Chrisafis, Angelique "France's horsemeat lovers fear US ban The Guardian, June 15, 2007, London. ^ "BBC NEWS – Programmes – From Our Own Correspondent – China's taste for the exotic". bbc.co.uk. June 29, 2002. ^ Podberscek, A.L. (2009). "Good to Pet and Eat: The Keeping and Consuming of Dogs and Cats in South Korea" (PDF). Journal of Social Issues. 65 (3): 615–632. CiteSeerX 10.1.1.596.7570. doi:10.1111/j.1540-4560.2009.01616.x. Archived from the original (PDF) on July 19, 2011. ^ "BBC NEWS – Asia-Pacific – Vietnam's dog meat tradition". bbc.co.uk. December 31, 2001. ^ Schwabe, Calvin W. (1979). Unmentionable cuisine. University of Virginia Press. p. 168. ISBN 978-0-8139-1162-5. https://books.google.com/books?id=SiBntk9jGmoC. ^ Hanley, Susan B. (1997). Everyday Things in Premodern Japan: The Hidden Legacy of Material Culture. University of California Press. p. 66. ISBN 978-0-520-92267-9. ^ Schwabe, Calvin W. (1979). Unmentionable cuisine. University of Virginia Press. p. 173. ISBN 978-0-8139-1162-5. https://books.google.com/books?id=SiBntk9jGmoC. ^ "Carapulcra de gato y gato a la parrilla sirven en fiesta patronal". Cronica Viva. Archived from the original on November 17, 2010. Retrieved December 1, 2011. ^ Jerry Hopkins (May 15, 2004). Extreme Cuisine: The Weird and Wonderful Foods That People Eat. Tuttle Publishing. p. 25. ISBN 978-1-4629-0472-3. ^ Jerry Hopkins (1999). Strange Foods. Tuttle Publishing. p. 8. ISBN 978-1-4629-1676-4. ^ "A Guinea Pig for All Times and Seasons". The Economist. July 15, 2004. Retrieved December 1, 2011. ^ "Whaling in Lamaera-Flores" (PDF). Retrieved April 10, 2013. ^ Lawrie, 11, citing Ollson, V., Andersson, I., Ranson, K., Lundström, K. (2003) Meat Sci. 64, 287 and noting also that organically reared pigs "compare unfavourably" with conventionally reared ones "in some respects." ^ "Demand for organic meat on the rise, says Soil Association". Retrieved January 21, 2018. ^ a b c d e f g h i j k l m Buscemi, Francesco (2018). From Body Fuel to Universal Poison: Cultural History of Meat: 1900–The Present. Springer International Publishing AG. ISBN 978-3-319-72085-2. ^ Henchion, Maeve; McCarthy, Mary; Resconi, Virginia C.; Troy, Declan (November 1, 2014). "Meat consumption: Trends and quality matters". Meat Science. Meat Science, Sustainability & Innovation: ‘60th International Congress of Meat Science and Technology August 17–22, 2014, Punta del Este, Uruguay’. 98 (3): 561–68. doi:10.1016/j.meatsci.2014.06.007. hdl:11019/767. PMID 25060586. ^ Table adapted from Lawrie, 17. ^ "White Meat vs. Red Meat / Nutrition / Healthy Eating". Retrieved April 25, 2017. ^ Schurgers, L.J. ; Vermeer, C. (2000). "Determination of phylloquinone and menaquinones in food. Effect of food matrix on circulating vitamin K concentrations". Haemostasis. 30 (6): 298–307. doi:10.1159/000054147. PMID 11356998. ^ "Dietary Fiber". Ext.colostate.edu. Retrieved May 1, 2010. ^ Horowitz, Roger. "Putting Meat on the American Table: Taste, Technology, Transformation" The Johns Hopkins University Press, 2005 p. 4. ^ "Online Etymology Dictionary". Etymonline.com. October 16, 1920. Retrieved January 31, 2012. ^ a b c d e f g h i j k l Mills, E. (2004). "Additives". Encyclopedia of meat sciences (1st ed.). Oxford: Elsevier. pp. 1–6. ISBN 978-0-12-464970-5. ^ Damian Carrington, "Humans just 0.01% of all life but have destroyed 83% of wild mammals – study", The Guardian, 21 May 2018. ^ Sutter, John D. (December 12, 2016). "How to stop the sixth mass extinction". CNN. Retrieved January 10, 2017. ^ Morell, Virginia (August 11, 2015). "Meat-eaters may speed worldwide species extinction, study warns". Science. Retrieved January 10, 2017. ^ Hance, Jeremy (October 20, 2015). "How humans are driving the sixth mass extinction". The Guardian. Retrieved January 10, 2017. ^ a b Machovina, B.; Feeley, K.J. ; Ripple, W.J. (2015). "Biodiversity conservation: The key is reducing meat consumption". Science of the Total Environment. 536: 419–31. Bibcode:2015ScTEn.536..419M. doi:10.1016/j.scitotenv.2015.07.022. PMID 26231772. ^ Milman, Oliver (August 1, 2017). "Meat industry blamed for largest-ever 'dead zone' in Gulf of Mexico". The Guardian. Retrieved August 2, 2017. ^ Steinfeld, H. et al. 2006, Livestock’s Long Shadow: Environmental Issues and Options. Livestock, Environment and Development, FAO. ^ Holechek, J. L.; et al. (1982). "Manipulation of grazing to improve or maintain wildlife habitat". Wildlife Soc. Bull. 10: 204–10. ^ Strassman, B.I. (1987). "Effects of cattle grazing and haying on wildlife conservation at National Wildlife Refuges in the United States". Environmental Mgt. 11 (1): 35–44. Bibcode:1987EnMan..11...35S. doi:10.1007/bf01867177. ^ Launchbaugh, K. (ed.) 2006. Targeted Grazing: a natural approach to vegetation management and landscape enhancement. American Sheep Industry. 199 pp. ^ Gerber, P.J., H. Steinfeld, B. Henderson, A. Mottet, C. Opio, J. Dijkman, A. Falcucci and G. Tempio. 2013. Tackling climate change through livestock – a global assessmaent of emissions and mitigation opportunities. Food and Agriculture Organization of the United Nations, Rome. 115 pp. ^ Behrens, Paul; Jong, Jessica C. Kiefte-de; Bosker, Thijs; Rodrigues, João F.D. ; Koning, Arjan de; Tukker, Arnold (December 19, 2017). "Evaluating the environmental impacts of dietary recommendations". Proceedings of the National Academy of Sciences. 114 (51): 13412–17. Bibcode:2017PNAS..11413412B. doi:10.1073/pnas.1711889114. ISSN 0027-8424. PMC 5754780. PMID 29203655. ^ Carus, Felicity (June 2, 2010). "UN urges global move to meat and dairy-free diet". The Guardian. Retrieved June 11, 2015. ^ Gibbens, Sarah (January 16, 2019). "Eating meat has 'dire' consequences for the planet, says report". National Geographic. Retrieved February 14, 2019. ^ Carrington, Damian (October 10, 2018). "Huge reduction in meat-eating 'essential' to avoid climate breakdown". The Guardian. Retrieved April 18, 2019. ^ Williams, Mark; Zalasiewicz, Jan; Haff, P.K. ; Schwägerl, Christian; Barnosky, Anthony D.; Ellis, Erle C. (2015). "The Anthropocene Biosphere". The Anthropocene Review. 2 (3): 196–219. doi:10.1177/2053019615591020. ^ Smithers, Rebecca (October 5, 2017). "Vast animal-feed crops to satisfy our meat needs are destroying planet". The Guardian. Retrieved October 5, 2017. ^ Carrington, Damian (May 21, 2018). "Humans just 0.01% of all life but have destroyed 83% of wild mammals – study". The Guardian. Retrieved June 29, 2018. ^ Bar-On, Yinon M; Phillips, Rob; Milo, Ron (2018). "The biomass distribution on Earth". Proceedings of the National Academy of Sciences. 115 (25): 6506–11. doi:10.1073/pnas.1711842115. PMC 6016768. PMID 29784790. ^ Ripple WJ, Wolf C, Newsome TM, Galetti M, Alamgir M, Crist E, Mahmoud MI, Laurance WF (November 13, 2017). "World Scientists' Warning to Humanity: A Second Notice". BioScience. 67 (12): 1026–28. Bibcode:1985BioSc..35..499W. doi:10.1093/biosci/bix125. ^ Devlin, Hannah (July 19, 2018). 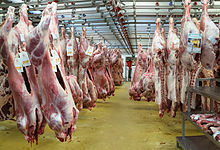 "Rising global meat consumption 'will devastate environment'". The Guardian. Retrieved July 21, 2018. ^ Anderson, D.C. (1978). "Use of cereal residues in beef cattle production systems". J. Anim. Sci. 46 (3): 849–61. doi:10.2527/jas1978.463849x. ^ Elferink, E.V. ; Nonhebel, S.; Moll, H.C. (2008). "Feeding livestock food residue and the consequences for the environmental impact of meat". J. Clean. Prod. 16 (12): 1227–33. doi:10.1016/j.jclepro.2007.06.008. ^ Martinez-Hurtado, J L (November 2013). "Foods". Iridescence in Meat Caused by Surface Gratings. 2 (4): 499–506. doi:10.3390/foods2040499. hdl:10149/597186. PMC 5302279. PMID 28239133. Retrieved March 1, 2014. ^ Ronald B. Pegg; Fereidoon Shahidi (2004). Nitrite Curing of Meat: The N-Nitrosamine Problem and Nitrite Alternatives. John Wiley & Sons. ISBN 978-0-917678-50-9. ^ Waxman, Jonathan; Steele, Tom; Flay, Bobby; Kernick, John (2007). A Great American Cook: Recipes from the Home Kitchen of One of Our Most Influential Chefs. Houghton Mifflin Harcourt. ISBN 978-0-618-65852-7. ^ Raymond Sokolov (2003). The Cook's Canon: 101 Classic Recipes Everyone Should Know. HarperCollins. p. 183. ISBN 978-0-06-008390-8. ^ Timothy J Key; Gary E Fraser; Margaret Thorogood; Paul N Appleby; Valerie Beral; Gillian Reeves; Michael L Burr; Jenny Chang-Claude; Rainer Frentzel-Beyme; Jan W Kuzma; Jim Mann; Klim McPherson (September 1999). "Mortality in vegetarians and non-vegetarians: detailed findings from a collaborative analysis of 5 prospective studies". American Journal of Clinical Nutrition. 70 (3): 516S–24S. doi:10.1079/phn19980006. PMID 10479225. Retrieved May 20, 2013. ^ "Some individuals, especially teen boys and adult men, also need to reduce overall intake of protein foods by decreasing intakes of meats, poultry, and eggs and increasing amounts of vegetables or other underconsumed food groups." in "2015 – 2020 Dietary Guidelines for Americans: Shifts Needed To Align With Healthy Eating Patterns: A Closer Look at Current Intakes and Recommended Shifts: Protein Foods" (8 ed.). U.S. Department of Health and Human Services and U.S. Department of Agriculture. December 2015. Retrieved January 9, 2016. ^ a b Püssa, Tõnu (December 1, 2013). "Toxicological issues associated with production and processing of meat". Meat Science. 95 (4): 844–53. doi:10.1016/j.meatsci.2013.04.032. ISSN 1873-4138. PMID 23660174. ^ Staff. "World Health Organization – IARC Monographs evaluate consumption of red meat and processed meat" (PDF). International Agency for Research on Cancer. Retrieved October 26, 2015. ^ Hauser, Christine (October 26, 2015). "W.H.O. Report Links Some Cancers With Processed or Red Meat". The New York Times. Retrieved October 26, 2015. ^ Staff (October 26, 2015). "Processed meats do cause cancer – WHO". BBC News. Retrieved October 26, 2015. ^ Renata Micha. "Red and Processed Meat Consumption and Risk of Incident Coronary Heart Disease, Stroke, and Diabetes Mellitus". ahajournals.org. ^ Snowdon, D.A. ; Phillips, R.L. ; Fraser, G.E. (1984). "Meat consumption and fatal ischemic heart disease". Preventive Medicine. 13 (5): 490–500. doi:10.1016/0091-7435(84)90017-3. PMID 6527990. ^ "Eating processed meats, but not unprocessed red meats, may raise risk of heart disease and diabetes". harvard.edu. ^ Vergnaud, Anne-Claire; Norat, Teresa; Romaguera, Dora; Mouw, Traci; May, Anne M.; Travier, Noemie; Luan, Jian'an; Wareham, Nick; Slimani, Nadia (August 1, 2010). "Meat consumption and prospective weight change in participants of the EPIC-PANACEA study". The American Journal of Clinical Nutrition. 92 (2): 398–407. doi:10.3945/ajcn.2009.28713. ISSN 1938-3207. PMID 20592131. ^ Astrup, Arne; Clifton, Peter; Layman, Donald K.; Mattes, Richard D.; Westerterp-Plantenga, Margriet S. (November 1, 2010). "Meat intake's influence on body fatness cannot be assessed without measurement of body fat". The American Journal of Clinical Nutrition. 92 (5): 1274–75, author reply 1275–1276. doi:10.3945/ajcn.110.000661. ISSN 1938-3207. PMID 20844064. ^ Vergnaud, Anne-Claire; Norat, Teresa; Romaguera, Dora; Peeters, Petra HM (November 1, 2010). "Reply to A Astrup et al". The American Journal of Clinical Nutrition. 92 (5): 1275–76. doi:10.3945/ajcn.110.000786. ISSN 0002-9165. ^ Casas-Agustench, P.; Bulló, M.; Ros, E.; Basora, J.; Salas-Salvadó, J. (July 1, 2011). "Cross-sectional association of nut intake with adiposity in a Mediterranean population". Nutrition, Metabolism, and Cardiovascular Diseases: NMCD. 21 (7): 518–25. doi:10.1016/j.numecd.2009.11.010. ISSN 1590-3729. PMID 20219336. ^ Lin, Yi; Bolca, Selin; Vandevijvere, Stefanie; De Vriese, Stephanie; Mouratidou, Theodora; De Neve, Melissa; Polet, Anja; Van Oyen, Herman; Van Camp, John (April 1, 2011). "Plant and animal protein intake and its association with overweight and obesity among the Belgian population". The British Journal of Nutrition. 105 (7): 1106–16. doi:10.1017/S0007114510004642. ISSN 1475-2662. PMID 21144092. ^ Wasley, Andrew (February 21, 2018). "'Dirty meat': Shocking hygiene failings discovered in US pig and chicken plants". The Guardian. Retrieved February 24, 2018. ^ Corpet, Denis; Yin, Y; Zhang, X; Rémésy, C; Stamp, D; Medline, A; Thompson, L; Bruce, W; et al. (1995). "Colonic protein fermentation and promotion of colon carcinogenesis by thermolyzed casein". Nutr Cancer. 23 (3): 271–81. doi:10.1080/01635589509514381. PMC 2518970. PMID 7603887. ^ "National Cancer Institute – Heterocyclic Amines in Cooked Meats". Cancer.gov. September 15, 2004. Retrieved May 1, 2010. ^ "Heterocyclic Amines in Cooked Meats – National Cancer Institute". Cancer.gov. September 15, 2004. Retrieved May 1, 2010. ^ "PAH-Occurrence in Foods, Dietary Exposure and Health Effects" (PDF). Archived from the original (PDF) on May 19, 2011. Retrieved May 1, 2010. ^ Leroy, F; Praet, I (July 2015). "Meat traditions. Co-evolution of humans and meat". Appetite. 90: 200–11. doi:10.1016/j.appet.2015.03.014. PMID 25794684. Retrieved April 11, 2015. ^ Takhar, Opinderjit Kaur (2005). "2 Guru Nanak Nishkam Sewak Jatha". Sikh identity: an exploration of groups among Sikhs. Ashgate Publishing, Ltd. p. 51. ISBN 978-0-7546-5202-1. Retrieved November 26, 2010. ^ Loughnan, Steve; Bastian, Brock; Haslam, Nick (2014). "The Psychology of Eating Animals" (PDF). Current Directions in Psychological Science. 23 (2): 104–08. doi:10.1177/0963721414525781. Retrieved August 6, 2015. ^ Rozin, Paul; Hormes, Julia M.; Faith, Myles S.; Wansink, Brian (October 2012). "Is Meat Male? A Quantitative Multimethod Framework to Establish Metaphoric Relationships". Journal of Consumer Research. 39 (3): 629–43. doi:10.1086/664970. ^ Dhont, Kristof; Hodson, Gordon; Costello, Kimberly; MacInnis, Cara C. (April 2014). "Social dominance orientation connects prejudicial human–human and human–animal relations". Personality and Individual Differences. 61: 104–08. doi:10.1016/j.paid.2013.12.020. hdl:1854/LU-5041485. ^ Keller, Carmen; Seigrist, Michael (January 2015). "Does personality influence eating styles and food choices? Direct and indirect effects". Appetite. 84: 128–138. doi:10.1016/j.appet.2014.10.003. PMID 25308432. ^ Richardson, NJ; et al. (1994). "Consumer Perceptions of Meat" (PDF). Meat Science. 36 (1–2): 57–65. doi:10.1016/0309-1740(94)90033-7. PMID 22061452. Retrieved August 10, 2015. ^ Zur, Ifat; Klöckner, Christian A. (2014). "Individual motivations for limiting meat consumption". British Food Journal. 116 (4): 629–42. doi:10.1108/bfj-08-2012-0193. ^ Schösler, Hanna; Boer, Joop de; Boersema, Jan J. (2012). "Can we cut out the meat of the dish? Constructing consumer-oriented pathways towards meat substitution". Appetite. 58 (1): 39–47. doi:10.1016/j.appet.2011.09.009. PMID 21983048. Wikimedia Commons has media related to Meats. Wikivoyage has a travel guide for Meat. IARC Monographs Q&A on the carcinogenicity of the consumption of red meat and processed meat.